Where: The group meets in New York City's Prospect Park on Wednesdays and Saturdays and in Central Park on Tuesdays, Wednesdays and Saturdays. 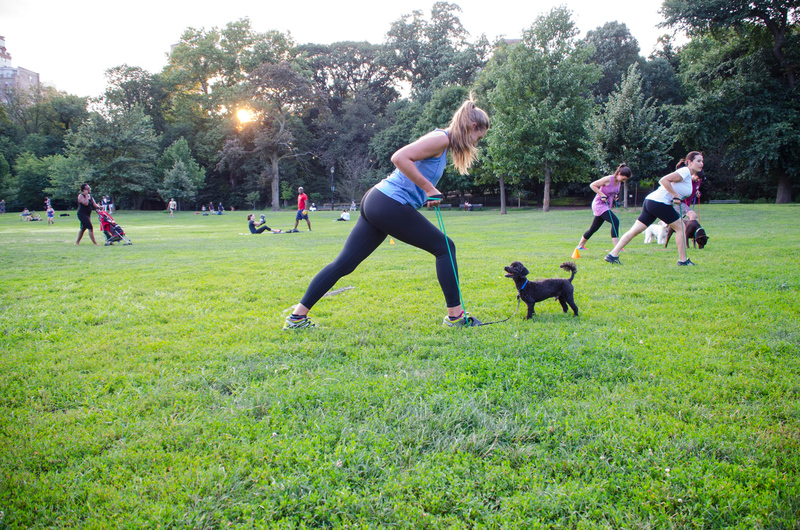 What We Did: Go Fetch Run offers full-body, outdoor workouts to fitness enthusiasts and their pooches. Founder Angi Aramburu and her Chihuahua, Chiquita (pictured above), started the class off with a light jog and some simple dog training to get our pups into the right mindset. We then continued the cardio with a relay circuit of jogging, pushups and burpees. Next came the strength training, which consisted of squats and resistance-band arm exercises, like bicep curls and rear flys. We'd reward the dogs (and simultaneously torture ourselves) by running or doing the grapevine up and down a nearby hill. OK, so it wasn't quite that traumatic, but it certainly proved to be tougher than it looked. I could definitely feel the skipping, cone-weaving and plank crawls. My dog, Ted, on the other hand, cruised through it effortlessly. Maybe it helps to have two extra legs. We ended with even more planks and some quick stretching. For How Long: The class lasted for an hour. How'd It Feel? Did we get a full-body workout? Yes. Did we both have fun? Definitely. Did my dog behave? Well, not really. He spent most of the class yanking at the leash, whining and trying to get frisky with a neighboring pooch (this probably says more about my dog-training skills than the class itself). While Ted's behavior was a bit embarrassing and interfered slightly with my own workout, our fellow classmates were friendly and understanding. The other dogs seemed well-behaved, so maybe it takes a few tries to get the hang of it. Plus, it sure beats a boring old treadmill. What It Helps With: My heart rate was up and the class challenged my arms, core and legs. We even ended with a bit of stretching. Go Fetch Run really does offer a total body workout, and if you push yourself, you'll likely leave feeling, well, dog-tired. What Fitness Level Is Required: There was a wide range of ages, gender and fitness levels in the class, in both humans and pups. Everyone was welcoming and no one was intimidating. Plus, the instructor offered plenty of modifications to make exercises both easier and more challenging. What It Costs: A drop-in costs $20, but there are package deals available as well. Would We Do It Again: Count us in! Even burpees are more fun with furry friends.